On the page you can see three new online webcam Pattaya, which allows to observe view on a some distance the central beach resort. Web cams installed in such a way that in the field of view placed very large areas of Central Pattaya (main bay of the resort, including the city’s main pier and also the big part of the Gulf of Thailand from Pattaya to the nearest islands, including the most popular recreational coral island Koh Lan. These cameras are the perfect complement to the previously added to the site. All three new online webcams Pattaya offered service Seeitlive Thailand and they work on the principle of online slideshow, ie video stream is not transmitted, and exchangeable with a certain periodicity photographs taken in real time, as evidenced by a special timer set at the bottom side webcams. You must remember that time in Thailand is different from the time of the London, Los Angeles or New York (UTC +07:00). Also there is indicated and the date too. The update online photo depends on the speed of your Internet connection, ie, at high-speed internet image is updated every 5-7 seconds, in other cases, ie, at a slower internet images from Web cameras will be updated several times per minute. Run all your webcam automatically after the page loads, but in some cases up to start playback of all or one of the chambers may take some time (usually 15-30 seconds). The first webcam from the observation deck of Pattaya, within walking distance from the famous sparkling in the dark colored inscription “Pattaya – city” is located in such a way that you can see almost 90% of the Pattaya Bay and the entire coastal area: Bali Hai pier together with the building offices, all Walking Street, which is considered close as possible thanks to the recently appeared on the new online webcams Pattaya Walking Street, many high-rise buildings and condominium hotels located in the coastal strip of the resort, and that the last few years changed the face of Pattaya City. The second webcam of Pattaya from the lookout at the 50% overlap with the first image, because they are installed at one point, but the second is more turned towards the sea. Because of this with the help of the camera can no longer see the central coastal area of ​​Pattaya, but still can be considered part of the town pier, from where tourists and locals can easily made way from Pattaya to Koh Larn Island by ferry. Like the previous, second webcam shows excellent activity in the waters of the resort: the number of large and small boats and yachts count is problematic. Most of the day the first and second cameras transmit roughly the same picture in terms of color. But closer to the sunset, when the sun moves below the horizon to the west, you will notice that the brightness is slightly different, so the clouds, the water in the Gulf of Thailand and the buildings on the coast acquire different shades. 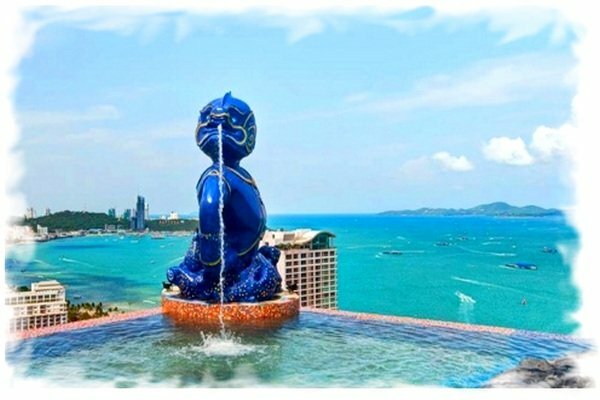 The third Pattaya webcam, which allows to admire the water area of the Gulf of Siam in the central part of the resort and its surroundings, was set at the Siam @ Siam Design Hotel Pattaya, which is located close to the northern part of central Pattaya. In the foreground – the hotel pool located on the roof of the building and allows guests not only to sunbathe and swim, but also to observe the surroundings at the same time for many kilometers away. Even looking at the picture with a webcam, you can make sure that the views are truly spectacular and exciting. Because of the location, the best picture with the new Pattaya webcam achieved in the morning, when the sun stains the water in the Gulf of Thailand in the vibrant colors and at sunset, when the sun slips below the horizon right in the center of the web of the playback window chamber. Once stop working of webcam Jomtien Beach, it was with the help of this handy watch the sunset in Pattaya, which is visible not from each point of the resort. In the afternoon, due to oncoming bright sun image becomes darkened. By the way, the thai southern sun quickly rolls are not in the sea, and hides behind the aforementioned article coral island of Koh Larn, whose silhouette is clearly visible in the central part. It is because of this magnificent species on the island, sunset, coastal part and the magnificent pool Hotel Siam @ Siam Design Hotel Pattaya is so popular with tourists from around the world. After all, a good 4-5 star hotels a lot, and here are located many of them are not so well, and the pool is situated on high-rise not everyone. Above this is a search form with which you can always find out the cost of accommodation in Hotel Siam @ Siam Design Hotel Pattaya on your dates, and can always be sure that the price offered to you is the best on the market at the moment, because Hotellook service not only checks availability of rooms at the hotel, but also compares the cost of one and the same hotel room in different booking systems, allowing us all to rest as comfortable as possible at the lowest price. Now this description of the new webcams overlooking Pattaya Bay completed. I wish you all a nice view and a pleasant stay at the resort!